Cutaneous melanoma (melanoma of the skin) occurs in many forms. The four most common forms are discussed below with photographs of typical cases; please note, however, that the physical appearance of melanoma can vary drastically, with cases that do not seem to carry any of the common physical characteristics. This fact makes bi-annual skin body examinations with a board-certified dermatologist extremely important for mitigating melanoma risk. Superficial spreading melanoma (SSM), also referred to as pagetoid (upward spreading) melanoma, is the most frequent form of melanoma, accounting for about 70% of all cases, and may therefore be regarded as the "common" or " prototypic" form of melanoma. SSM affects melanocytes, the pigment cells in the basal layer of the skin. SSM originates in the epidermis and grows on a two-dimensional plane (radial growth) across the skin before penetrating to deeper skin tissues (vertical growth). Because SSM affects pigment cells due to genetic mutations in melanocytes, SSM looks like irregular discolored skin similar to a mole. The lesions, which occur in a relatively young to middle-aged patient population, may occur on exposed skin but are more commonly found on intermittently-exposed skin and are rare on unexposed skin. In contrast to lentigo maligna, superficial spreading melanoma is believed to be associated with acute intermittent, rather than chronic continuous, sun exposure, which is often recreational rather than occupational. The most frequently involved sites are the upper back, especially in men, and the lower legs, especially in women. The lesions are slightly or definitely elevated, with a palpable border and an irregular outline. There is often variation in color that includes not only tan, brown, and black, but also pink, blue, and gray. In its early stage of development, superficial spreading melanoma may be indistinguishable clinically from a dysplastic nevus. 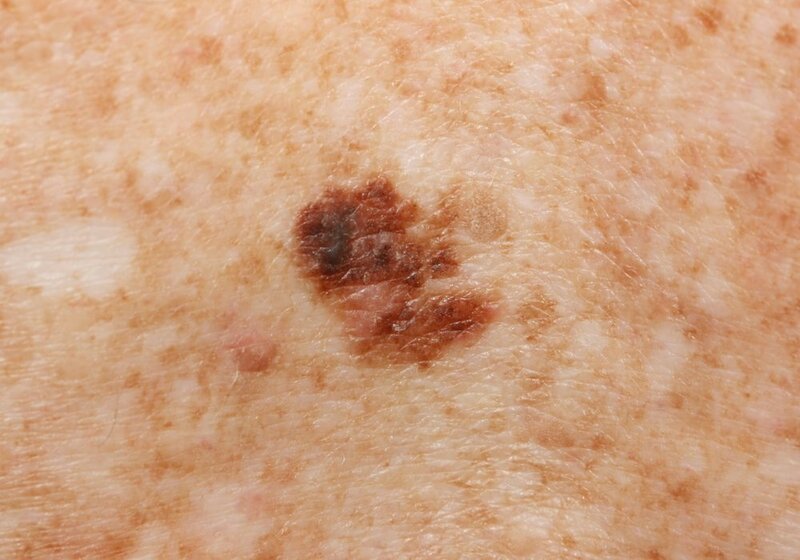 Dysplastic nevi are irregular-looking moles which carry the physical characteristics of melanoma, but are not in fact cancerous. This form of melanoma may occur anywhere on the body and can develop in previously benign moles. Lentigo maligna melanoma accounts for about 10% of melanomas and typically occurs on chronically sun exposed skin, most commonly on the face, and occasionally on the back, the forearms, or the lower legs. 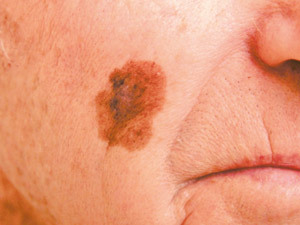 This form of melanoma is most common among the elderly. 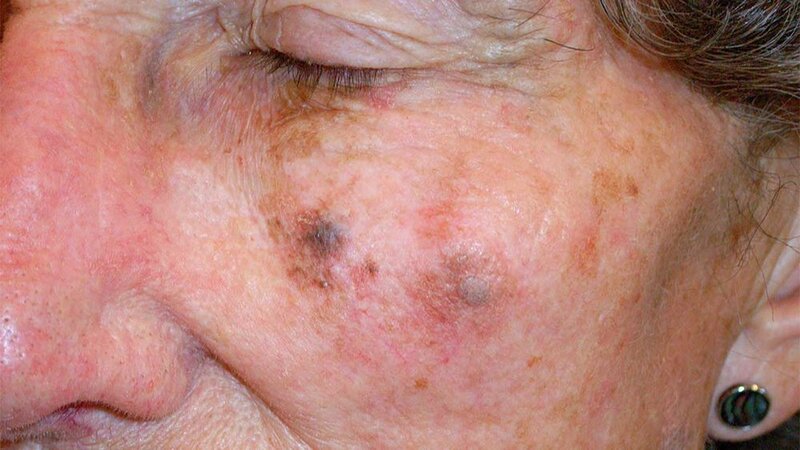 The lesions evolve slowly over many years, starting as unevenly pigmented macules (lentigo maligna) that gradually extend peripherally and may attain a diameter of several centimeters. The color varies from light brown to brown with minute dark-brown or black flecks. In contrast to superficial spreading melanoma, the border is usually impalpable or indistinct, blending into the normal surrounding skin. For this reason, the accurate clinical delineation of the border of a lentigo maligna melanoma can be problematic, and this not uncommonly results in unexpected positive or close margins in resection specimens. This means that surgically removing a lentigo maligna melanoma completely can be difficult as it is hard to determine the border between healthy and diseased skin. Nodular melanomas occur in slightly older patients than the common superficial spreading melanoma and are relatively more frequent in men. 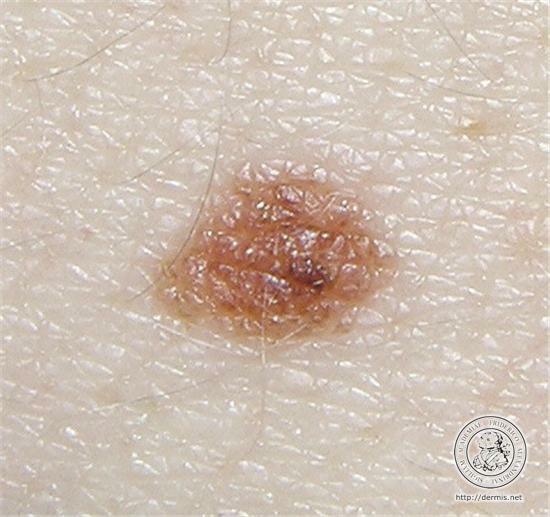 A nodular melanoma starts as an elevated, variably pigmented papule (abnormal raised skin) that increases in size quite rapidly to become a nodule and often undergoes ulceration. Nodular melanoma often carries a poor prognosis because of no prodromal (occurring before vertical growth) radial growth phase, early distant metastasis and significant tumor volume. The "ABCDE" melanoma identification criteria do not apply to nodular melanomas, which often present clinically as quite small, symmetric, and well-circumscribed papules or nodules with consistent dark color throughout. Refer to the "EFG" identification acronym described below. 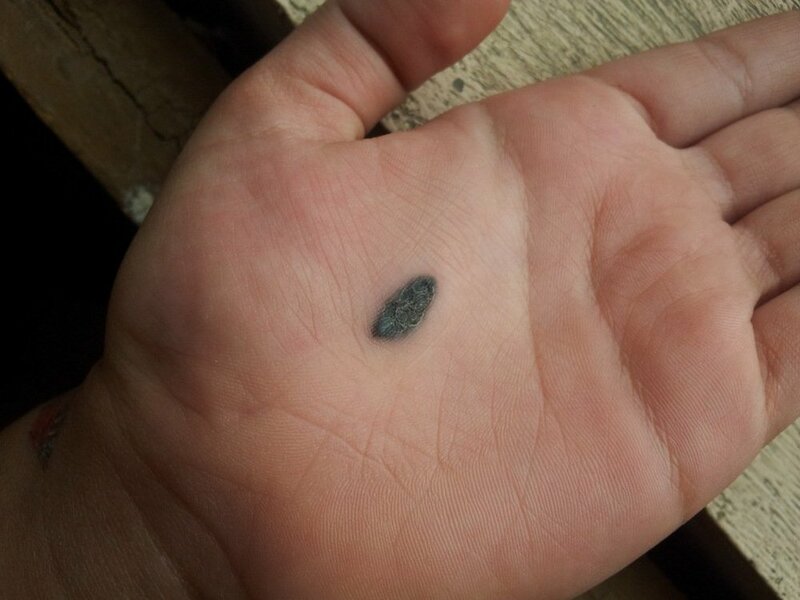 Acral melanoma occurs on the hairless skin of the palms and soles and in the ungual and periungual regions, the soles being the most common site. Acral melanoma is uncommon in all ethnic groups, but it is the predominant form of melanoma in individuals with darker skin. In groups such as Asians, Hispanics, Polynesians, and blacks, in whom the overall incidence of melanoma is low, most melanomas are of the acral type. However, the absolute incidence of acral melanoma in these groups is similar to that in whites, who have a much higher incidence of melanoma overall. Although the survival rate of patients with acral melanomas is relatively poor, this is likely due to their typically advanced microstage and/or stage at diagnosis, a result of late detection. 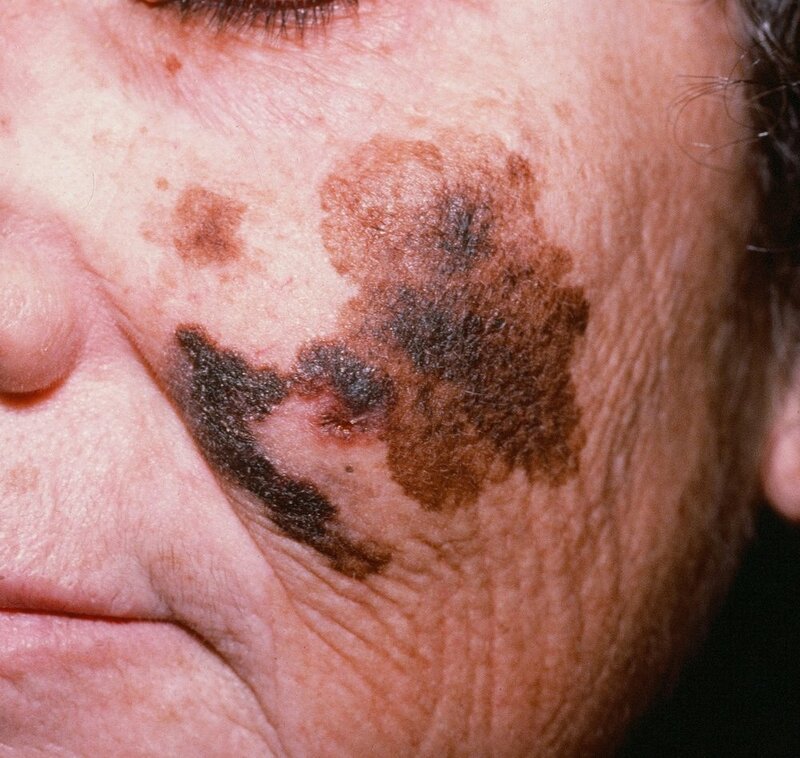 Clinically, in situ (confined to the top layer of skin) acral-lentiginous melanoma shows uneven pigmentation with an irregular, often indefinite border. The soles are most commonly involved. If the tumor is situated in the nail matrix, the nail and nail bed may show a longitudinal pigmented band (see right), and the pigment may extend onto the nail fold (Hutchinson's sign), which is the skin at the base of the nail. Because acral lentiginous melanoma (ALM) does not occur in sun-exposed regions of the body, its causes are not known. The high mortality rate observed in patients diagnosed with ALM is likely due to late diagnosis; therefore, the best prevention method for ALM is routine full body examination with your dermatologist every six months, and self examinations every two months.